In my mystery romance novel “Mystical Circles” I explore the interpersonal relationships to be found in the hothouse atmosphere of a New Age commune. This is a place where relationships and liaisons flare and flourish or fizzle out quickly. The group I describe is based in an idyllic farmhouse in the Cotswolds. It is a “closed environment” in the sense that all the people in the group spend a lot of time together, having to deal with all their emotions and feelings about each other, their conflicts, their doubts and fears. I also explore what people in these situations do about their baggage from the past. This particular group teaches its members to let go of their past. But is this, in fact, possible? For several moments then, they stood in silence, gazing at the Severn Vale spread out before them. “Almost as good as the view from Beaumaris,” he observed wistfully. He regarded her warmly, clearly touched by her empathy. “I’m so happy to hear that,” said Llewellyn. She chuckled but made no reply. Her stomach still felt twisted. Craig… Craig… she thought. “Maybe. But do those principles work out in practice? I certainly didn’t expect to find this level of frustration, anxiety and anger. I’ve found it in Oleg, Zoe, Sam…” She would certainly not mention Craig’s name. But what she really wanted to know was who wrote that letter to Craig. “Mine?” She was immediately on guard. “No, you’re not,” he said unexpectedly. “A step in what direction?” she asked. “The tank? What’s that? And what happens in it?” asked Juliet. Conversation halted. James, Craig and Sam all swivelled their eyes to her face. “Where is the tank?” she asked. They regarded each other slowly. “I doubt it,” she said. “But that’s exactly what I propose to do.” She had no desire for a battle of wills. But if he wanted one, so be it. “Llewellyn? What of him?” Juliet felt her jaw tighten. She gripped both sides of her laptop. So he was leaping to conclusions about her and Llewellyn. She stayed quiet, but her face burned. And yet, here she was, being eaten up by all sorts of worries. Zoe, and her infatuation with Theo. The doubts over Theo’s background. Then the fact that she still hardly knew who Craig was, and what he was about. Was he hiding something? What really lay behind his dysfunctional relationship with his father? And was it any business of hers anyway? But the answer to that, she knew, was yes. Because she cared about it – despite all her best intentions, she cared deeply. And she still hadn’t resolved the mystery of who wrote that letter to Craig. The writer clearly loved Craig, longed for him to come quickly, had felt guilty about him in the past, but had now been forgiven by Craig. Juliet wanted to know who that person was. She felt she had a right to know. And she wanted to be rid of this terrible feeling in her stomach whenever she saw Craig. Was it yearning? No, impossible! All she knew was that it was tearing her apart. And then there was the question of Rory and his unpredictable outbursts of aggression. Juliet knew Rory needed to be locked up. But that wasn’t going to happen. Not while Craig, for some twisted reason of his own, allowed him to run loose in this community. A US reviewer says: “What Juliet finds when she reaches the ranch is an oddly charismatic and dysfunctional group of people…. there are strange things happening in the commune, and when a priest shows up it further traumatizes the group… This loving and freedom-believing cult, while wonderful on the surface is a cauldron of deceit and depravity on the inside… keeps you in suspense… deals with how relationships are formed and how the smallest of happenings can shatter lives… Skillman is a deft hand at creating characters. If you are interested in people and their foibles, you will enjoy this book.” Read the rest of the review on www.amazon.com. In “Mystical Circles” I explore the conflict between two sisters Juliet and Zoe. Juliet, the older sister, aged around 30, is worried that the impetuous Zoe, age 22 and fresh out of university, has fallen in love with charismatic New Age guru Craig McAllister, and rushed off to join his esoteric spiritual group in the Cotswolds, where she seems determined to stay forever. How can the more sensible, responsible Juliet make Zoe see otherwise, and rescue her from this unsuitable man? “How are things going with Craig?” she asked. “Sure.” Juliet hurried after her sister. How she hoped Zoe would be reasonable, and at least understand her feelings. Unlatching the gate, Zoe went through, and Juliet followed. Before them appeared the uppermost of a flight of stone steps leading down to a sunken lawn with a water– lily pond. Craig had landscaped this garden to the very highest of standards. “This is stunning,” she said in awe. “Isn’t it?” Zoe indicated the Scots pines and the blue cedars over to the north of the sunken garden. The two girls went towards these. Scattered beneath were a number of white cane chairs, set amid clumps of purple delphiniums. “Whose side are you on?” Zoe’s expression had chilled. “We’re not like that Heaven’s Gate sect, you know,” Zoe protested. “You’d need to live as one of us to understand,” said Zoe. So she was going to be evasive. Juliet flared up. “Give me a break, Zoe. I won’t do that.” She saw her sister bite back a swift retort. Juliet is a freelance radio journalist. And while she’s here at the Wheel of Love she takes the opportunity to do interviews for a radio documentary about the group – with Craig’s permission of course. It’s a useful cover for her true motive of rescuting Zoe. But can Juliet stay objective? “The broadcast media has the highest code of conduct…” murmured Edgar. A titter passed between the other three at this. “What you suggest is impossible. If you’re to achieve anything here, you’ll have to take part, and live as one of us,” said Laura. Juliet swallowed two or three times to control her sense of panic. Deep down she knew Laura was probably right. And that was exactly what worried her. Could she pretend to go along with their beliefs without compromising herself? Weren’t they all nuts, in one way or another? She shrank from it. And yet she knew she wasn’t the only one here who felt like that. Surely Don did too. Extracts from Mystical Circles – What is Dream Yoga, as Practised by the Members of Craig’s Esoteric Group The Wheel of Love? Posted on April 18, 2011 May 3, 2014 CategoriesBooks, British mystery romance writer, creative writing, dreams and dreaming, inspiration, life, mystery romance, mystery romance writer, religion, SC Skillman, spirituality, WritingTagsdream yoga, esoteric, love, lucid dreaming, mystical circles, SC SkillmanLeave a comment on Extracts from Mystical Circles – What is Dream Yoga, as Practised by the Members of Craig’s Esoteric Group The Wheel of Love? What is dream yoga? Does it really exist? The answer is yes. It is one of the practices of Craig’s group The Wheel of Love, which I describe in my novel. I have investigated dream yoga myself in the past. It originates in Tibet, and through it one aims to achieve wholeness and self-knowledge by mastering the art of “lucid dreaming”. When the group gathered around Craig at the back door at six a.m., Juliet was encouraged by the brightness and freshness of the sky. A steady heat, enlivened by a crisp breeze, ensured that most walkers had chosen T-shirts and shorts this morning. Juliet spotted a footpath accessed by a stile. Beyond the trees, the side of the valley rose steeply through pasture to a wooded ridge. Her concentration returned to Craig, who was now telling the group that the first part of the walk was to be conducted in silence. So that meant she wouldn’t get the chance to quiz Zoe further on what she really felt about last night. Craig led his followers along a track that disappeared among the trees. Zoe walked way ahead of Juliet, who couldn’t see whether or not her sister was sticking close to Craig. Beth, she noticed, seemed to be missing, though Oleg was present. Everything about him suggested depression, even his tired-looking floppy beige hat. So much for the effect of last night’s Dynamic Meditation. They tramped for several minutes, sometimes through dense undergrowth that contained a lot of bramble, and eventually emerged on the top of the ridge. A glorious panorama of hills and fields spread out before them. But Craig didn’t allow them long to admire it. He instructed them to gather round. “This is where it gets interesting,” murmured Zoe to Juliet, before Juliet moved forward to put her mike in front of Craig’s mouth. Juliet shot him a look. He seemed serious. And they were all obeying. She had no option other than to join them, sticking close to Craig so she could be ready with the mike for his next utterance. Juliet caught sight of Oleg. He was in deep gloom. She stepped aside with her mike. “You don’t look enthralled, Oleg,” she said. But before he could reply, Craig’s voice cut in again and she swung round once more. Juliet joined them, unable to notice the reactions of the people around her until they’d completed the exercise. Then Craig seated himself on a fallen trunk, and asked how they’d felt when asked to do it, and during the walk; and whether those feelings had changed now they’d stopped. Juliet could detect no sign of dissent among them, apart from Oleg, who continued to look miserable. He seemed to be weighed down by some heavy problem; she resolved to get him to open up about it as soon as she had the chance. Juliet looked around, mike at the ready. Silence. Surely, someone other than herself must have doubts? But nobody expressed any. Were she and Don the only people in this community who still saw things from the perspective of the outside world? Not one of his followers spoke, or moved. A dreamlike quality had settled upon them all. Extracts from Mystical Circles – What is Dynamic Meditation, as Practised by Craig’s Esoteric Group The Wheel of Love? Posted on April 11, 2011 May 3, 2014 CategoriesBooks, British mystery romance writer, empowerment, inspiration, life, literature, love, mystery romance, mystery romance writer, SC Skillman, spirituality, WritingTagsBhagwan Sri, dynamic meditation, fictional characters, love, mystical circles, Rajneesh, SC SkillmanLeave a comment on Extracts from Mystical Circles – What is Dynamic Meditation, as Practised by Craig’s Esoteric Group The Wheel of Love? What is “Dynamic Meditation”? I describe this in my novel, as Craig leads a session for the members of his group The Wheel of Love. I observed this supposed “emotional release therapy” myself in the past, whilst investigating the practices and beliefs of the sannyasins who followed the guru Bhagwan Sri Rajneesh. Dynamic Meditation took place that evening in the barn. Surely, thought Juliet, as she stood at the rear of the spacious meeting room, with her portable recorder and mike, the original builders of this glorious sixteenth-century tithe barn would never have imagined that such use would ever be made of it. She gazed at the roof, a dazzling criss–cross of beams and wooden vaulting. Yes, the tenant farmer may well have held barn dances; but surely nothing of the nature of what Craig was leading his followers into right now. By nine o’clock the lights had been dimmed, and the sound of heavy metal music echoed up to the roof trusses, ricocheted off the hayloft and rebounded all around the stone walls. The hayloft, or upper room, could be accessed by two spiral staircases, one at the west side, and one at the east. Juliet had positioned herself beside the foot of the west one. She was trying to make herself heard as she explained her digital recording equipment to Don. Following Llewellyn’s words, he’d clearly felt sufficiently emboldened to try this session, but meant to stay at the back watching and listening. He moved closer to Juliet in order to hear her words. “Me too,” he said cryptically. “Certainly looks and sounds chaotic.” She gazed at the scene in front of her. She suspected that tonight would yield nothing her listeners could make sense of. But her concern for Zoe was far greater. What would her sister get up to with Craig in an atmosphere like this? And as for Craig himself, she’d be watching him very closely; for she found it impossible to believe he wouldn’t take advantage of his position, especially with the women, in such circumstances. And as if to confirm Juliet’s worst suspicions, Laura, her hair wilder than ever, was already tearing off her cotton print dress. Juliet feared Zoe would soon follow her example. She and Beth, however, had so far both kept their lycra leotards on. But, to Juliet’s confusion, Zoe was curled up in a foetal position in the corner, sobbing as if her heart would break. Should Juliet go over and comfort her? Or was this all part of the Dynamic Meditation and meant to serve a cathartic purpose? Her instincts told her it was the latter. The other members of the group were scattered across the available floor space, in a variety of postures and states of undress. Several danced; some had curled themselves into tight balls, and others writhed across the flagstone floor like snakes. Juliet followed Craig with her mike, as he strode around amongst them, looking authoritative and crackling with sexual energy, in a bottle–green leather jacket and Levi‘s, shouting at each in turn. She recorded him as best she could, whilst trying to keep an eye on Zoe. But her sister, it seemed, won no more from him than anybody else; and neither did Laura or Beth. To Craig’s credit, and Juliet’s mystification, he seemed to share his attention equally. His attention consisted largely of a verbal lashing. With each person he varied his remarks, depending, as he explained to Juliet a little later, upon their emotional situation. At Beth, who clearly had a problem with self-esteem, he hurled personal abuse; when Sam confessed fear and timidity, he compelled him to imagine the kind of exposure he most dreaded; finding Oleg full of anger, he provoked him to an even higher level of rage. The Slav then strode over to Beth and accosted her. Juliet watched closely. She’d already picked up emotions simmering between these two. What would happen now, in this overwrought situation? But before she could satisfy her curiosity, her attention was distracted. Laura, in a desperate attention-seeking measure, had finally peeled off her lacy knickers. But even this failed to win a special response from the group leader. However, the same could not be said of Al. Laura then gave herself over to what looked like a Dionysian frenzy. Edgar rolled around the floor giggling hysterically, creating a surreal effect with his monastic appearance. James, too, added to the madness of the scene by kicking his legs in the air and screaming like a child having a tantrum in a high–street store, without any regard to the state of his tailored trousers or natty cravat. The only question in Juliet’s mind was at which point one of the men would snap, leap onto Laura, and sexually assault her. Or settle for Craig instead, as some, in her view, might well do. She’d already begun forming opinions about their sexuality. It was when she began to focus on Craig’s, that she felt ambivalent. He was supposed to love her sister. But… Her mind went foggy beyond this. All she knew was it was a big but. Meanwhile, miraculously, here in the feverish atmosphere of the barn, no assault, sexual or otherwise, ever happened. Oleg now seemed to be performing t’ai chi; James was grinning inanely and blowing bubbles, and Al, who’d begun the evening in a benign frame of mind, was beating his head against the wall. At this point Craig turned the music off, and Juliet hurried across to him with the mike. Before she could speak he plunged himself into a lotus posture, and apparently into a state of deep meditation. Meanwhile, the participants lay around weeping or working out their distress in whichever way seemed best, or emerging slowly from hysteria. So Juliet moved among the group members instead with her mike, though there seemed no need to ask any of them to describe their feelings to her. Eventually all sounds faded into silence. Juliet set her Nagra on automatic voice-activated recording. Craig allowed stillness to reign for several minutes. Then he opened his eyes, stood up, and, looking around among his followers, began to speak. Absolute concentration gripped the members of the group. With that he dismissed them all. 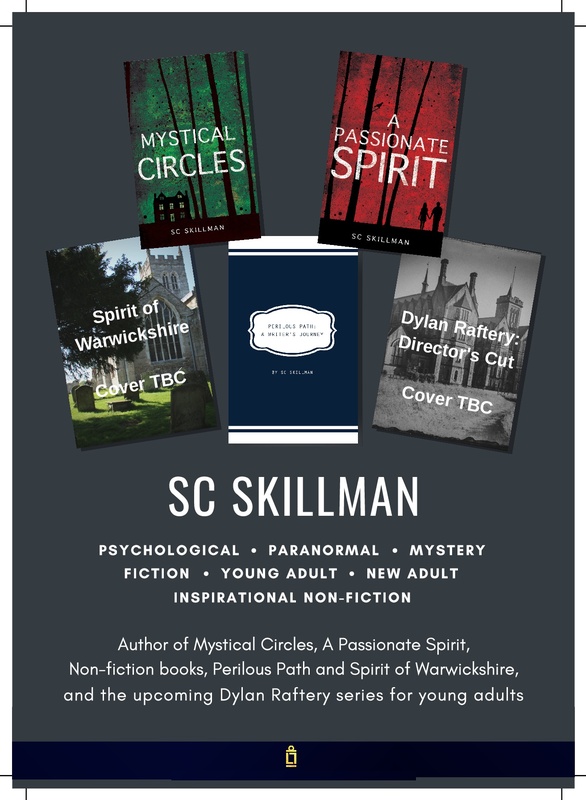 Characters in Mystical Circles – Beth, a Member of Craig’s Esoteric Group The Wheel of Love who Feels Unloved – will she Find Healing in Craig’s Community? Posted on April 4, 2011 May 3, 2014 CategoriesBooks, British mystery romance writer, creative writing, life, literature, love, mystery romance, mystery romance writer, SC Skillman, spirituality, WritingTagsesoteric, fictional characters, healing, love, mystical circles, SC Skillman, spiritualLeave a comment on Characters in Mystical Circles – Beth, a Member of Craig’s Esoteric Group The Wheel of Love who Feels Unloved – will she Find Healing in Craig’s Community? Beth doesn’t really know why she’s here; she’s edgy, tense, anxious. Is she searching for the healing that Craig promises? And is she prepared to do the mysterious “work” on herself that Craig requires? She doesn’t want to tell Juliet about her past. She hero-worships Craig, but he’s inaccessible. There is one in the group who would love her in the way she longs for… but is she able to respond to him? She is in a spiritual community where all members are supposed to “share love equally” yet Beth feels unloved and unloveable. Juliet exchanged a wave of acknowledgement with Laura, seated opposite the American, before turning her attention to the next diner, beside Laura. Well, thought Juliet, Beth wasn’t very friendly. How had Juliet managed to earn her hostility so soon? Beth continued to look tense and suspicious. Perhaps she misunderstood what Juliet was trying to do. But if she didn’t say anything, Juliet couldn’t put her mind at rest. Juliet shifted position so she could also observe Beth, who’d so far remained silent. She wanted to see if Beth was reacting to Oleg in any way. But no, her eyes were on Craig. Beth was in love with Craig, Juliet had no doubt about that. Poor girl. What prospects did she have, with Zoe so ahead of the game? Her sister was chatting animatedly to Craig. Sparkling and pretty, Zoe had everything going for her to win first place in Craig’s affections. “I’ve been invited here to ask questions,” said Juliet gently. Beth drained her glass of wine and refused to look at her again. Instead she switched her glance to Oleg, who’d left his seat at the end of the table, and come up to speak to her. She gave him full attention for the first time during the meal. He leaned down towards her, and laid his hand on hers. She jumped as if someone had laid hot metal on her bare flesh. Instead of having the desired effect, this seemed to destabilise her further. She pushed her chair back and sprang to her feet. “Goodbye, everyone.” With that, she headed round behind Juliet’s chair, whirled past The Lady and the Unicorn, and vanished through the doorway into the sitting room. Extracts from “Mystical Circles” – the Charismatic Craig has a Strange Gift for Sudden Changes of Appearance – is he a Shaman? Posted on March 28, 2011 May 3, 2014 CategoriesBooks, British mystery romance writer, creative writing, life, literature, mystery romance, mystery romance writer, SC Skillman, spirituality, WritingTagsesoteric, fictional character, mystical circles, psychological suspense, SC Skillman, Shaman, strange giftLeave a comment on Extracts from “Mystical Circles” – the Charismatic Craig has a Strange Gift for Sudden Changes of Appearance – is he a Shaman? Craig has a strange and unsettling habit of changing his appearance in front of Juliet’s eyes. What is this all about? It is certainly a gift that he has, and a skill that does come from an arcane body of knowledge. You will have to read “Mystical Circles” to find out exactly how Craig does this, and what it means. But it is a phenomenon I have myself witnessed in the past. Then she dropped her fork. Craig’s features had changed. She wasn’t at all sure how, but his face was unrecognisable. She stared. Her fingers had turned cold. All the charm of his handsome features had melted away, and now she saw something that looked to her like an ancient face, like a stone carving on a rock in the rose-red city of Petra in Jordan. Most creepy of all, Zoe appeared totally unaware of it. So did Rory and Don. Juliet continued to stare at Craig, dumbstruck. As she did so, his former identity returned, shifting back into place like the next frame on a movie reel. “Thank you, Rory, that’s enough.” Craig now evidently considered it time to insist upon a change of subject. But Juliet could barely continue eating. Her fingers were trembling too. What had she just witnessed? Or had she imagined it? Had somebody spiked her wine? Certainly, nobody else seemed to have noticed Craig doing anything untoward. At this moment, Craig caught her eye. She read in his glance, Don’t worry. You’ll understand, later. Zoe had now clearly noticed something. She looked suspicious. Taking a grip on herself, Juliet lifted another forkful of food, trying to push down her disbelief at what she’d seen. She determined to find out later what had happened. But most definitely she couldn’t think of Craig in the same way again. “I can change my appearance at will,” Craig said. A creepy sensation travelled up her spine. He released her. She flexed her shoulders and arms for a few moments, trying to calm her breathing. She didn’t trust herself to pursue the subject further. “Shall we sit down again?” she suggested. She struggled to settle her inner turmoil. But, instead, whilst groping towards some kind of exit from the fog gathering around her, she slipped further in. Now she felt a curious instability, as if she was on a jetliner that had flown into an air pocket. In the next moment she received the impression that Craig’s features had melted and re-aligned themselves. Instead of looking at him, she believed she faced someone infinitely old and wizened, and Peruvian in appearance. The image of an ancient carved face on a rock in an Inca city, presented itself to her. It shifted again, and a new face emerged, that of a shabby, travel-stained New Age traveller. With a desperate effort of the will, she regained her awareness of Don beside her. But he was set into a freeze– frame. His hand had risen, perhaps to admonish Craig, but had then been arrested in mid-air. He wore a glazed expression. Craig smiled, and as he did so the spell, or whatever it was, lifted. All returned to normal. Don’s hand dropped to his side. Juliet realised she’d held her breath for several moments. She gasped the air back into her lungs. Her heart was pounding. Craig had done it again. Changed appearance. What was it with him? How did he do it? It frightened her. Her eyes were fixed upon his face. She hardly cared if he thought her rude to stare at him. Then Don spoke. “Well, Craig? What’s your answer?” It was as if nothing had happened. Hadn’t Don noticed? She was astounded. Craig interlocked his fingers, and laid them lightly upon his knee. “I believe we must learn to live at a high level of uncertainty,” he said. Characters in Mystical Circles – will the Advent of the Rev.Theo Save or Shatter Craig’s esoteric Wheel of Love Community? Posted on March 21, 2011 May 3, 2014 CategoriesBooks, British mystery romance writer, faith, life, literature, love, mystery romance, mystery romance writer, religion, SC Skillman, spirituality, Uncategorized, WritingTagsclergyman, esoteric, fictional characters, love, mystical circles, save or shatter, SC SkillmanLeave a comment on Characters in Mystical Circles – will the Advent of the Rev.Theo Save or Shatter Craig’s esoteric Wheel of Love Community? Juliet has already heard quite a bit about Theo from various Wheel of Love group members before he first appears on the scene. And what she learns about him raises her curiosity. What exactly is this “wilderness experience” he has only recently emerged from? Why is James surprised he managed to get ordained? What can he possibly have in common with the members of Craig’s group? And what is he doing here anyway? A buzz ran round the table. There was a good deal of table-thumping and laughter at this, until Craig’s voice dropped into the swell of sound. At once, hush descended. Juliet allowed her eye to skim the diners. Craig’s presence and personal style exerted a powerful effect upon them. The group burst once more into animated chatter, alongside much clattering of cutlery and glasses. But Juliet felt faintly oppressed by her vulnerability. She had no idea what to expect over the coming days. How would she balance her commitment to do interviews with the need to keep track of Zoe? One thing was for sure. She certainly wouldn’t be seduced by Craig’s brand of healing and wholeness, if that was what it was. She turned to Don. “Have you met Theo?” she asked in a low voice. “Theo sounds more than a little unorthodox,” she remarked, “if he’s willing to come here.” She heard Don chuckle. Before he could reply, Don distracted her, holding out the dish of risotto Beth had passed him. “Like some, Juliet?” he asked. “Oh, yes please. That smells and looks very good,” she said. When they were ready to set off, Juliet looked straight at the clergyman. Theo wore an open expression on his face. “What your sister wants,” he said, “is to experience the spiritual reality here on this earth, in her own body.” He opened the door and stepped out. She followed. “And has Craig delivered on it yet?” she asked. There was a pause, as she wondered how Theo would take this question, together with all its implications. He began to stride across the car park. Juliet had no time to consider her riposte to this evasive answer. She hurried to keep up with him, holding the omni–directional mike. She checked the sound levels as he walked briskly past the north side of the house, and across into the orchard. It looked as if he’d settled on the same route that she, Al and Laura had taken last night on their trip to the top of the valley to look at the stars. He smiled, and headed on through the orchard, toward the gate at the other side. “I’m glad it looks like that to you,” he said. “How do you find Craig’s teachings?” she asked. “I admire Craig’s idealism. I don’t accept all his theories. Nor do I believe in God.” They reached the gate. “What sort of God don’t you believe in?” asked Theo. When Juliet first meets Rory Anstruther-Jones, she is intrigued, but doesn’t trust him. He speaks of having a “thorn in the flesh” – but what does this mean exactly? Then Juliet’s glance was drawn on to the next diner. He for his part gave her a watery smile. His pink shirt was teamed with a blue–and–white polka–dot bow tie. Even though seated, he was head and shoulders above his neighbours. How, she wondered, did he manage with all the low ceilings in this farmhouse? She tried to recall the date she’d seen engraved above the front door. Ah yes – 1532. Certainly they must have been shorter in those days. Ah-ha. The one she had to handle with caution. “Good to meet you, Rory,” she replied. Tall as he was, Rory presumably managed somehow. She observed too that he’d blow-dried his blond hair. He leaned forward, across Don, extending long, slender fingers to clasp her hand. She registered the slippery quality of his touch. She was also struck by the curious unreality of his porcelain complexion. “Well, Rory, what can I say to that?” murmured Juliet. She was unsure how she felt about his remarks; certainly, she didn’t trust him. But there again, neither did she trust anyone else. She raised her eyebrows, careful not to commit herself. “Planning to bite her, are you?” said James from across the table. Craig silenced him with a look. “What kind of occult activity, Rory?” he prompted. “I do. Very well,” said Craig cryptically. Juliet looked from one to the other, alerted. Why had Craig not been keen for him to stay longer? Clearly Rory had ignored this and stayed on anyway. If Craig wasn’t happy about it, why hadn’t he chucked Rory out? She didn’t doubt the strength of his personality. She found it difficult to believe he wouldn’t deal firmly with wastrels and hangers-on, if such Rory was. But for now, the matter must remain a mystery. A sharp silence fell. James applied butter to his bread roll in short, terse strokes of the knife. “Can you account for that experience of Rory’s, Craig?” asked Juliet.